Dutch students Wieke Reekers and Gina van Wingerde were not even sure what political party Frans Timmermans belonged to. "We just looked it up: Labour," Van Wingerde told EUobserver on Tuesday (2 April) in the Dutch city of Leiden, where the European Commission's second-in-command had just finished a 90-minute Q&A session. 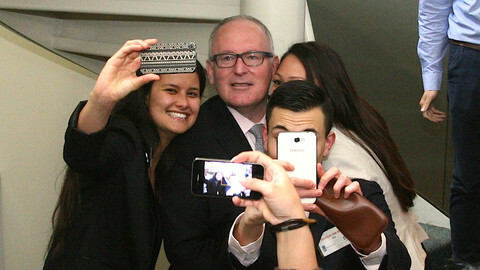 The centre-left Timmermans was here as part of the commission's 'citizen dialogues', aimed at bridging the often-cited gap between ordinary Europeans and the EU. It was the 1,500th such event in Europe, according to the moderator. Timmermans was there as the first vice-president of the commission. 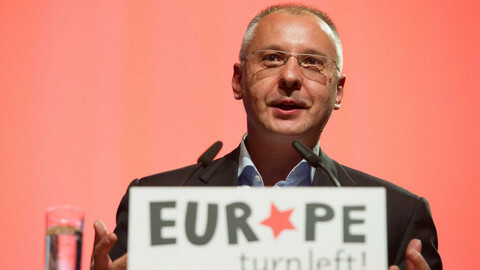 However, Timmermans is also the Party of European Socialist's (PES) lead candidate to become commission president, succeeding his boss Jean-Claude Juncker. He is also on Labour's list to become an MEP at the May elections. Under Juncker's leadership, the rules were changed to allow campaigning for an EU post while in office as a commissioner - as opposed to commissioners campaigning for a national domestic post, who have to take a leave of absence. The new rules raise questions about the blurring of lines of a commissioner acting in the common interest of the EU and the commission, and a commissioner campaigning on behalf of his or her political party. 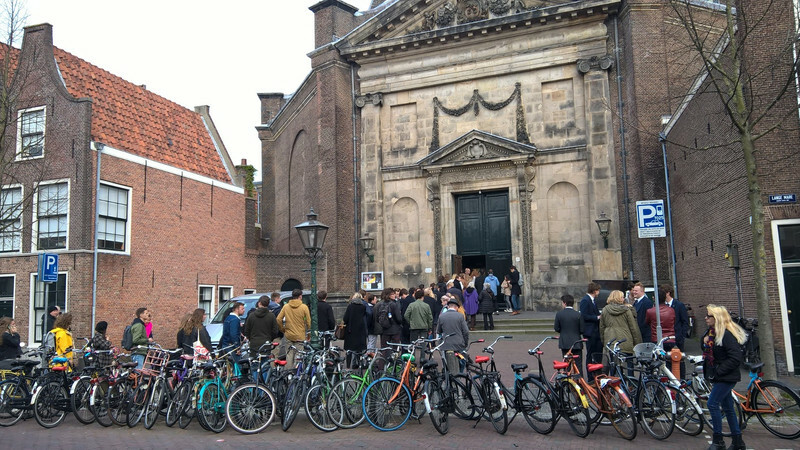 At the event in Leiden, the Dutch politician succeeded in remaining non-partisan. Not once did he mention his centre-left Labour party, the word 'Spitzenkandidat' or his European political family. A feat of restraint, considering the event took place less than eight weeks before the European Parliament elections. But at the same time, Timmermans, a former minister of foreign affairs, did offer a distinctive view of European integration. "I would have been surprised to find out if he had been a member of a right-wing party," admitted Van Wingerde. Another student, Thom van Leuveren, also said he heard a "left-wing vision" on Europe, but saw Timmermans more as a "European politician" than as a member of centre-left Labour. "I thought that he was not explicitly campaigning, but he was there as a vice-president," he said. While he operated in a non-partisan way, in line with the commission code of conduct, he was definitely not neutral. Timmermans spoke as a representative of the pro-EU mainstream, which wants to deepen EU integration, rather than as a candidate of a specific party. That may backfire, as anti-EU parties can argue that the centrist mainstream parties are all the same. Of course, Timmermans was asked to give his opinion of the most recent local election vote in the Netherlands, which saw success for one of those anti-EU parties. 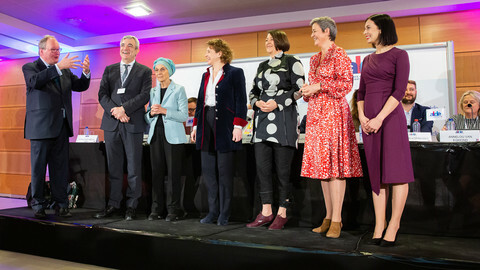 The Timmermans event took place less than two weeks after provincial elections were won by a three-year-old right-wing anti-EU party called Forum for Democracy. The provincial vote will shape the distribution of seats in the parliament's upper house, the senate, next month. The Forum victory happened in an increasingly fragmented political landscape, in which becoming the largest party is less impressive than when only two or three mainstream parties divided more than half of the votes, a few decades ago. Many of his voters switched from that other anti-EU party, Geert Wilders' Party for Freedom. But it was still a shock to many that the party came out as the largest with 13 of 75 seats - ahead of prime minister Mark Rutte's liberals' 12 seats. In Timmermans' analysis, there is an increasingly realisation among Europeans that they are interdependent, and that this leads to two different reactions, depending on people's general attitude to life. "People with an optimistic nature say: hey, we depend on each other, so let's get to work together. People who are pessimistic see that dependency as a threat, and want to get rid of that dependency," he said. He warned that you can't turn pessimists into optimists within a few weeks, but also stressed that the appeal to a Dutch exit from the EU, or 'Nexit', seemed to have weakened after the UK referendum vote to leave. 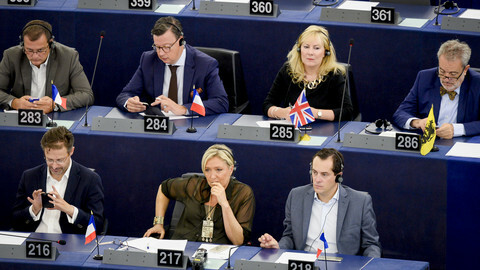 The chaos which followed in British politics "brought tears to my eyes", said Timmermans. He noted that the official line of both Forum for Democracy and Wilders' party is still to pursue Nexit. "But Brexit has had a deterring effect on many people," said Timmermans. "Otherwise Wilders would still be shouting for a Nexit, and he hasn't done that for a long time. That is purely because of Brexit," he added. Timmermans ended his Q&A session, which allowed for a dozen or so questions from the audience, with an appeal to go out and vote. "Make a choice," he said. "Make a choice for the left, make a choice for the right, make a choice for the centre. Never become indifferent," he noted. Implicit was the warning that those that want to break up the EU are not indifferent, and will do so if given the chance. The event was opened with a speech by Leiden mayor Henri Lenferink, a fellow Labour member. Lenferink noted how "Europe-minded" Leiden is, and referred to the 2016 referendum on the EU-Ukraine association treaty, which was rejected. Leiden was one of two municipalities in the province where a majority voted in favour of the Ukraine treaty. 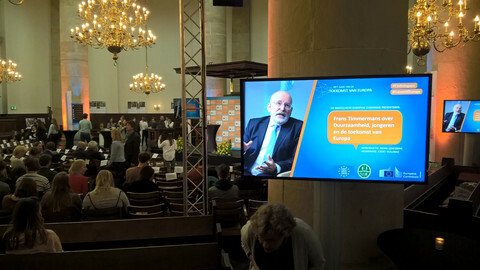 Thus, it was not only because the event took place in a 17th century protestant church, that Timmermans was preaching to the converted.